Dr. Thomas Grogard Barnes, Professor Emeritus of Physics, was a \"Physicist\'s Physicist\" and a man of great character. Immensely popular with his students, he was warmly referred to by many as Dr. ?Two Gun? Barnes. He earned degrees from Hardin-Simmons University and Brown University. His academic advisor, the famous Dr. R. Bruce Lindsey, referred to him as one of his most talented graduate students. He served at the University of Texas El Paso (UTEP) from 1938 until his retirement in 1981. Barnes published more that 35 articles and five books. A young-earth creationist, Dr. Barnes helped found the Institute for Creation Research (ICR) in 1964, the Creation Research Society in 1972, and the ICR Graduate School in 1981. He is well-known for his studies of the earth\'s magnetic field, which he claimed decays in accordance with a young earth paradigm. Several of his writings from the 1970s and 1980s explore the foundations of electrodynamics, and suggest alternative mechanisms for understanding relativity based on feedback and classical electromagnetic theory. His early physical models for the electron inspired later scientists like David Bergman and Charles W. Lucas of Common Sense Science. Barnes was a founding editor of Galilean Electrodynamics in 1990 and of Foundations of Science in 1997. Served on the Editorial Board of the science journal Galilean Electrodynamics. Thomas G. Barnes , \"Resonant Optics for Detection of Rotation and Translation\", Galilean Electrodynamics, V2, N3, p. 55 [Correspondence V2, N4, p. 77] (1991). Thomas G. Barnes & Harold S. Slusher, \"Space Medium Theory Applied to Lunar and Stellar Aberration\", Galilean Electrodynamics, V1, N4, p. 43 [Correspondence V1, N5, p. 68] (1990). Thomas G. Barnes, \"Electric Explanation Of Inertial Mass \", Creation Research Society Quarterly, V19, N4 (Mar 1983). Thomas G. Barnes, Harold S. Slusher, G. Russel Akridge, & Francisco S. Ramirez IV, \"Electric Theory of Gravitation\", Creation Research Society Quarterly, V19, N2, pp. 113-116 (Sep 1982). Thomas G. Barnes & Franciso S. Ramirez IV, \"Velocity Effects on Atomic Clocks and the Time Question\", Creation Research Society Quarterly, V18, N4 (Mar 1982). Thomas G. Barnes, \"Satellite Observations Confirm the Decline of the Earth\'s Magnetic Field\", Creation Research Society Quarterly, V18, N1 (Jun 1981). Thomas G. Barnes, \"New Proton and Neutron Models\", Creation Research Society Quarterly, V17, N1, pp. 41-47 (Jun 1980). Richard R. Pemper & Thomas G. Barnes, \"A New Theory Of The Electron\", Creation Research Society Quarterly, V14, N4, pp. 210-220 (Mar 1978). 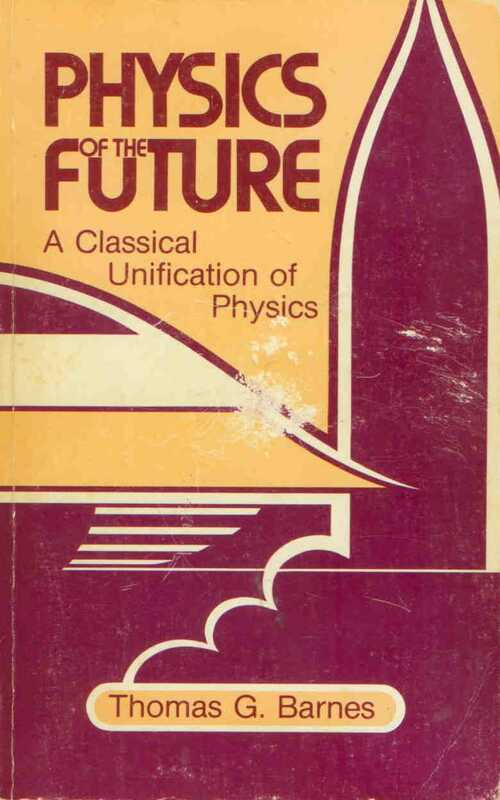 Thomas G. Barnes, Richard R. Pemper & Harold L. Armstrong, \"A Classical Foundation For Electrodynamics\", Creation Research Society Quarterly, V14, N1, pp. 38-45 (Jun 1977). Thomas G. Barnes & Raymond J. Upham, Jr., \"Another Theory of Gravitation: An Alternative to Einstein\'s General Theory of Relativity\", Creation Research Society Quarterly, V12 N4, pp. 194-197 (Mar 1976). Thomas G. Barnes, \"Earth\'s Magnetic Energy Provides Confirmation of Its Young Age\", Creation Research Society Quarterly, V12, N1 (Jun 1975).